Some news from the Indian Maruti Desert Storm Rally: Overnight leaders Abhishek Mishra in the Xtreme class and Aaron Mare of Aga’nta Racing in the Motorbikes class maintained their overall leads after the conclusion of the fourth leg of the 2018 Maruti Suzuki Desert Storm Rally. With one short stage of 25 km to go in the fifth leg, it can be safely said that the frontrunners look to claim the titles in their respective classes, barring some unfortunate mechanical problems. According to the partial provisional standing, which might change after the calculation of the final penalties, Mishra behind the wheels of a Suzuki Grand Vitara, leads the field by more than 15 minutes with a total time of 11:15:54. Raj Singh Rathore is currently lying in second place with a total time 11:30:57, while Vikram Jain is in third place with a total time of 12:20:21. The fourth leg turned out to be hard for Maruti Suzuki Motorsports as their last two remaining cars failed to make it home after the finish of Leg 4A. Sandeep Sharma driving a prototype four-wheel drive S-Cross ground to a halt in the morning stages with a damaged radiator. Dharampal Jhangra driving yet another prototype four-wheel drive, Vitara Brezza suffered a turbo failure that forced him to stop in the middle of his run. In the Motorbikes class, the night stages were canceled in the interest of rider safety. Instead, the organizers, Northern Motorsports, ran three stages in the morning to mark the completion of leg four in the Moto class. Though Mare, by the virtue of good show in the previous legs, maintained his overall lead according to the partial provisional standing, it was Santalino Lorenzo of TVS Racing who was the star of the day. The Spanish rider won all the three stages to cut into Mare’s overnight lead. Going into the final stage, Mare leads the timesheets with a total time of 07:44:22. Santalino Lorenzo is currently in second place with a total time of 07:49:43, while Sanjay Kumar also of Ang’ata Racing is in third place with a time of 08:18:56. But it’s still not over for Mare. It has been reported that his KTM 450 is suffering from an internal oil leak, while Kumar is dealing with gearbox issues with his bike stuck in third gear. 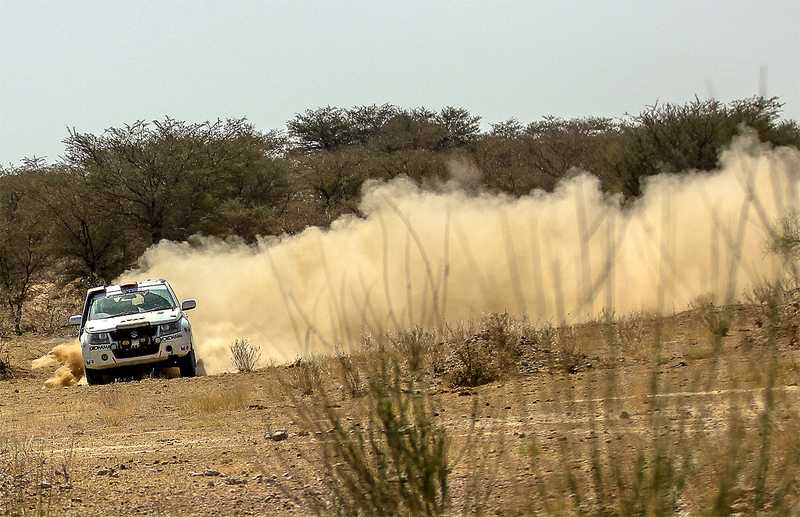 With just 25 km left in the 2018 Maruti Suzuki Desert Storm, the game is still wide open in the Moto class. The fourth leg turned out to be troublesome for TVS Racing as Tanveer Abdul Wahid was forced to retire with mechanical issues.